HOW TO AVOID THEM is an amazing online English language course where I have collected 73 the most common mistakes in English. 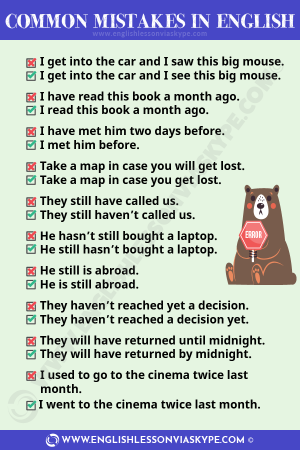 These common mistakes in English were made by my students, real people, just like you. These common mistakes in English are made by ESL students regardless of their nationality. Why enrol in Common Mistakes in English Course? You want to speak English with confidence. Making a lot of errors in English usage didn't help anyone, right? You want to speak English like a native speaker. Actually, native speakers often make mistakes. So you want to speak better than a native English speaker. Following over 30 years working in business I changed my career path and reinvented myself as a Teacher, teaching English as a Foreign Language. I obtained my TEFL qualifications and have now been teaching English over 8 years both online using Skype™ and in face-to-face lessons. I am successfully teaching to a very wide range of students across several continents. I specialise in Business English but happily teach students with any English learning needs. I have assisted many students to successfully pass a variety of English proficiency exams to gain employment with European or American organisations where English was the language of choice. This is an introductory lecture to give you a bit of a flavour what this course is about. 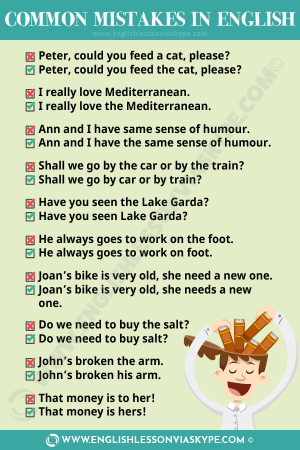 In this section we will review first 10 common mistakes in English. These mistakes are mostly made in spoken English. In this lecture we will go through the next 10 common mistakes in English. And these again are related to spoken English. 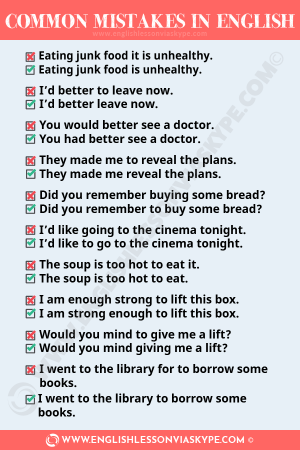 Here we will review the next 10 mistakes made in spoken English. By the end of this lecture you will be familiar with 40 very common mistakes. This should definitely improve your spoken English. We are nearly there. By the end of this section you will be able to avoid 53 COMMON MISTAKES made in spoken English. Excellent news! Everybody has an accent. I have an accent. My children have accents. Even the Queen has an accent. Sometimes you are able to get rid of your accent or to change your accent (for example, if you move to a new country) but in most cases it is not easy. However, your pronunciation is very very important. And in this lecture I will help you improve your English pronunciation. Can i pay for your online course in a different currency? When will I get access to common mistakes in english course? Who should take common mistakes in english course and what is required? Dear Students at elementary English level (A1), please do not enrol! What will I be able to do after completing your english course? If you complete Common Mistakes in English without skipping any lectures, by the end of this course you will have an excellent understanding of what are the most common errors in English usage. You will be able to analyse your own mistakes in English and you should be able to avoid making the same mistakes in the future. If you are in doubt, just review your lectures or have a quick look at your cheat sheets. Did I tell you that cheat sheets are available to download? So if you enrol and most importantly you finish Common Mistakes in English course, you will be able to speak better English. Is that not what you want to achieve? This course is covered by 30 days money back guarantee. If you genuinely don’t like it, you will receive a refund.